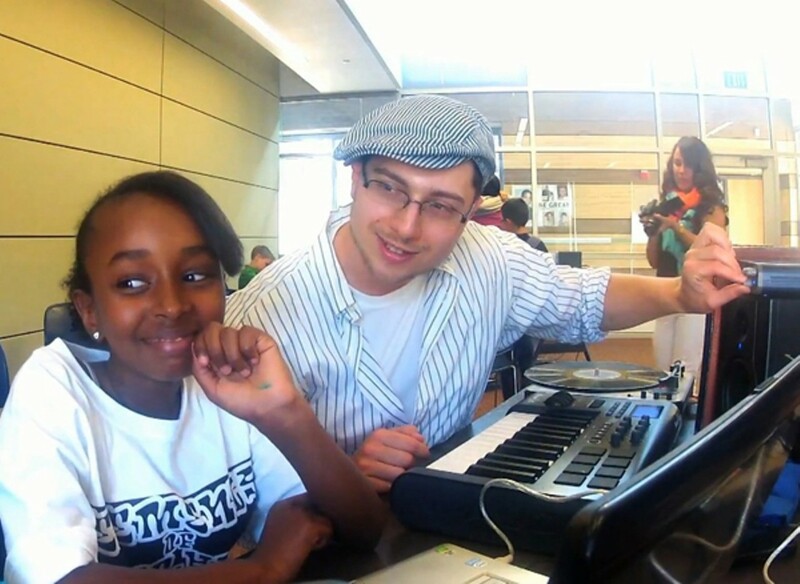 Elliot Gann teaches kids in West Oakland how to make beats — and cope with trauma in the process. Kids learn to play drum rhythms on the MIDI controller. Back in 1997, Elliot Gann bought a CD that would have a lasting impact on his life. It was the OM Records compilation Deep Concentration Vol. 1, which featured legendary producers Cut Chemist, Prince Paul, and Mumbles, and, more importantly, which came with a CD-ROM that included Mix Man, an early production software that allowed users to remix the tracks on their home computers. "That was when I really started making beats," said Gann. Soon, he began subscribing to electronic and hip-hop magazines in order to stay up on the latest software and sounds. For fifteen years he's made beats and released them independently. Today, he boasts, "I can teach anyone to make a beat in thirty minutes." Mostly, however, he's passing on the craft to kids in West Oakland. 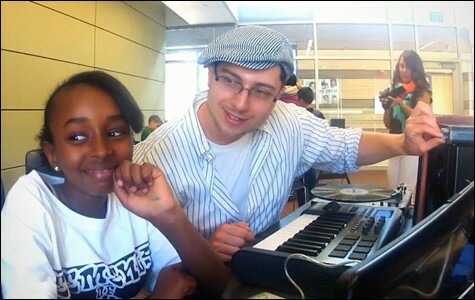 Twice a week, Gann visits West Oakland Middle School to teach kids music production skills, or beat-making. Gann, or "Dr. Elliot," as the children affectionately call him, is the founder of Today's Future Sound, a nonprofit he started seven months ago to serve underprivileged youth with the goal of not simply improving their music skills, but also with helping their personal development. Gann received his Ph.D in psychology from Berkeley's Wright Institute in 2010 and views his service as an alternative to traditional psychology. "It's an effective way to deliver services that maybe a traditional therapist can't," said Gann. "It's teaching kids coping mechanisms. It's teaching them to regulate themselves. I think it's a really healthy way to help kids process trauma." And it's clear how much the activity resonates with students. On a recent weekday afternoon, a classroom full of excited children greeted Gann. "Dr. Elliot! Are we going to finish our beat today?" "Dr. Elliot! Can I make a 2 Chainz beat?" "Dr. Elliot! Can I make a beat with you?" Gann calmly told the children to work quietly and that he would call them one at a time to work with them individually. The first student he called appeared visibly upset. Gann asked if he was okay and discovered that the student's mother passed away unexpectedly the previous week. Gann immediately switched into therapist mode. "Oh my God, I'm so sorry to hear that," he said. "That's terrible. You know, man, if you need to talk, you know I'm a therapist. If you need or want to talk, I got you." Read the rest of this story at OaklandNorth.net.